Mother’s Day is coming up, which means that it is time to think about some DIY Mother’s Day gifts. I wanted to do something special for little ones…like really little ones. Whether you’re a Mom looking for something that your wee little ones can make for their grandmothers or even a Dad who wants to do something special for Mom this Mother’s Day, these DIY gifts to make with kids are so simple that, well toddlers can make them! Kids love doing special things for Mom and Dad and these projects are so easy that they can do most of them all by themselves. If your little ones love crafts, they are going to adore these super easy DIY Mother’s Day gifts. Even older children can do these if they want and they make wonderful gifts for Moms and some of them even make great gifts for Dads. If you’re looking for an easy DIY Father’s Day gift, I have got a great list of 25 manly DIY Father’s Day gifts made from upcycled materials that will want to check out. From jewelry to pictures and even some fun finger painted gifts, your toddlers and preschoolers are going to love these DIY Mother’s Day gifts. They will have so much fun making them and Mom is sure to treasure each and every one of them. If your kids want to do their own gifts for Mom this year, there is definitely something in this list that you will want to try. And, be sure to also take a look at these 50 Mother’s Day gifts that you can make for under $50. There are things in here for adults to enjoy! 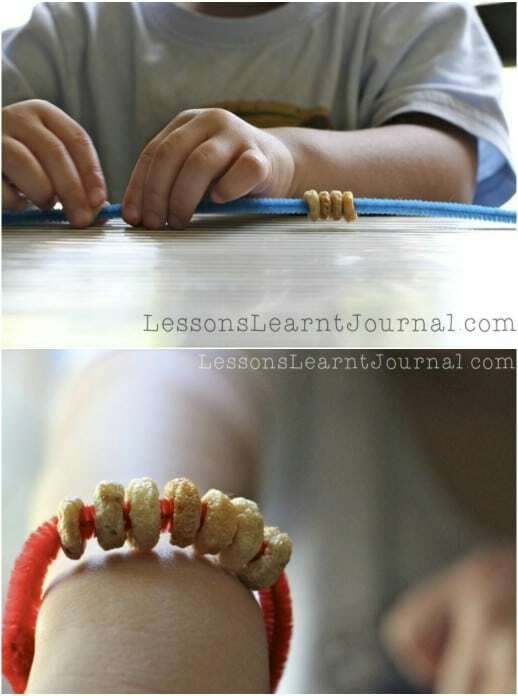 This adorable little bracelet is made with pipe cleaners and Cheerios and it is perfect for little hands to DIY. Not only do they get the satisfaction of making Mom’s Mother’s Day gift on their own, this one is great for helping to develop hand eye coordination. It’s a simple project for toddlers or preschoolers and it makes an adorable little bracelet for Mom to wear on her special day. 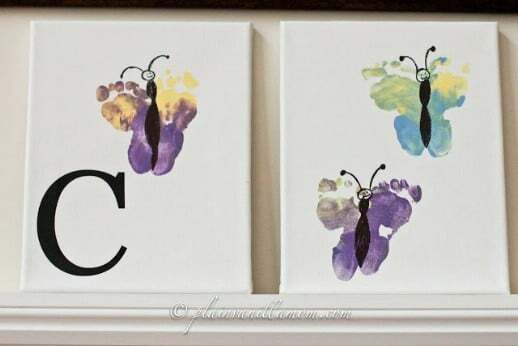 Mom will adore having these little footprints to hang on her wall and of course, kids love playing in paint, right? 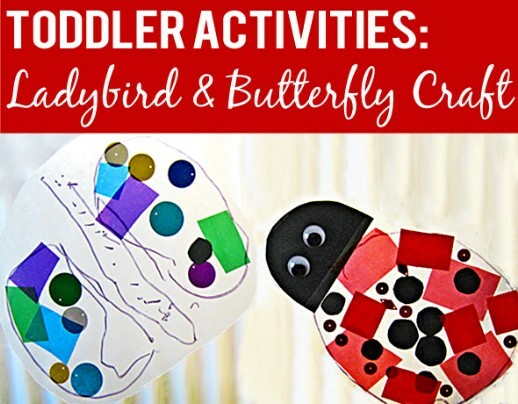 These butterfly footprint art pieces are so easy to make and your little ones can virtually do them all on their own. This is also a great little project for infants although you will need to help them with the paint. Just let them step into paint and then step on a canvas and then add embellishments to your butterflies. 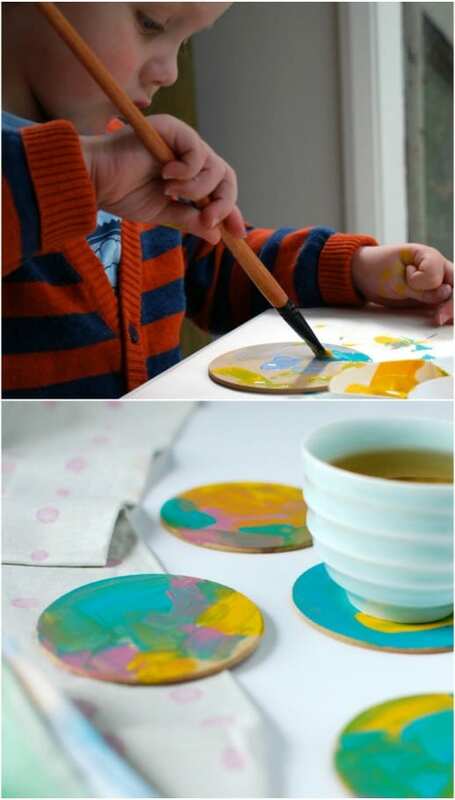 These little coasters couldn’t be easier to make, even for toddlers. You just need some wooden coasters and some paints – and of course, a toddler or two. They can create their own designs and all kids love to paint, right? Let them be as creative as they want to be and make Mom something really special just from them for Mother’s Day. The great part about these DIY clay necklaces is that they air dry. You don’t have to worry about baking the clay in order to finish the jewelry, so this one is perfect for two and three-year-old toddlers. You may have to help them with rolling out the clay but they can use cookie cutters and other similar items to cut out their clay beads and then string them all up. They can even paint and otherwise decorate their necklaces to make them unique. Moms love DIY jewelry that helps them dress up their wardrobes! If you make the blocks for them, your toddlers can make their own block print napkins to give Mom on her special day. These are really simple for toddlers to make and if you have more than one little one, they can each do a napkin or let them create an entire set of four. 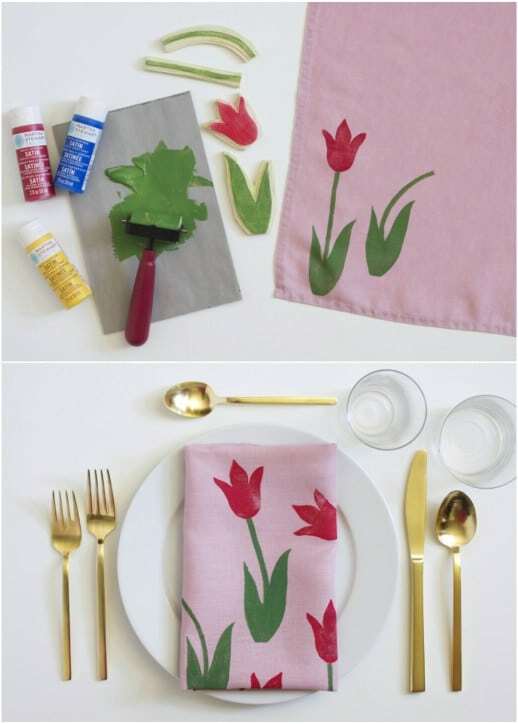 You just need to create the block stamps and have a few cloth napkins on hand. Creating these easy to DIY bookmarks not only gives your toddlers something for Mom on her special day, they will inspire them to read! 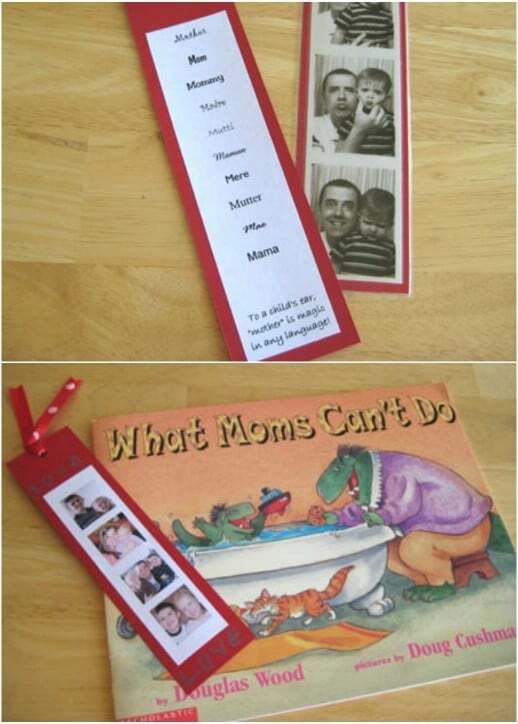 These are so simple to make and little ones can help to choose the pictures that they want to include and glue those images on the bookmark. They could even color their own pictures if they want – these DIY bookmarks are very versatile. 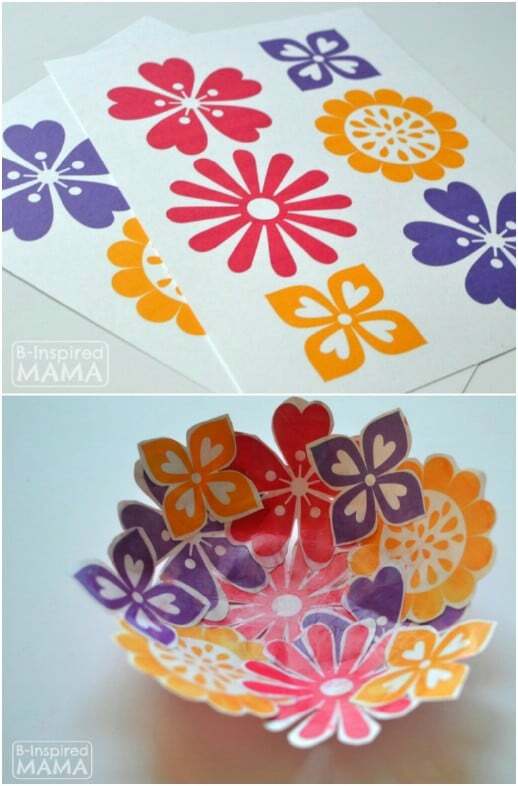 Window clings are a great gift for Mom on Mother’s Day and toddlers will find these DIY versions very easy to do. You need a few supplies for these, like colored paper, googly eyes, cellophane, and basic craft supplies. Help your little ones with the cutting and they can do the decorating and gluing all on their own. A few different sizes, shapes and colors of buttons and a metal lid are all your toddler needs to make these adorably colorful DIY button pendants for Mom. You just gather a collection of buttons – your local thrift store has these for literally pennies – and then let your little one choose their own design, gluing them in as they go. Baby food jar lids work really well for this one, or you can use any screw off lid that you may have on hand. Moms love candles and toddlers love coloring, which makes these DIY artwork candles the perfect gift for Mother’s Day. These are simple to make and all you need is a tall white pillar candle and a few basic craft supplies. 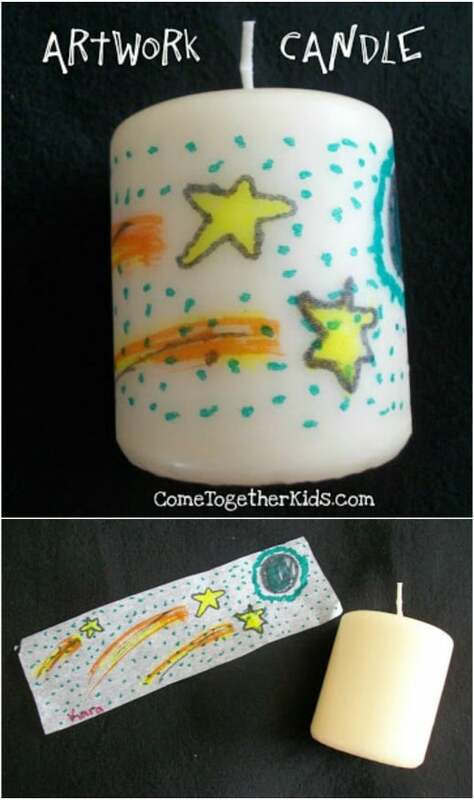 Your toddlers and preschoolers can color or draw on the candles with any number of tools and create their own little designs. You help their design to stay intact with a heat gun or blow dryer. DIY candles are always a good gift idea for Moms. These cute little wooden clothespins double as clips for recipes, important mail or anything else when your toddlers and preschoolers decorate them with washi tape. 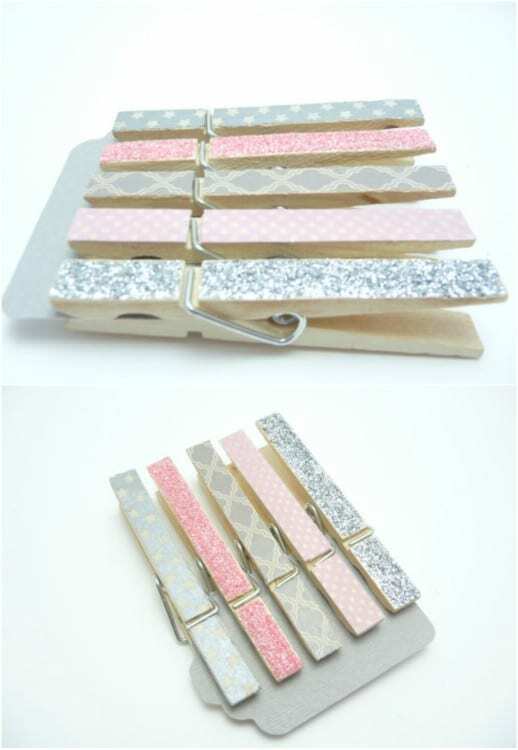 Washi tape comes in so many different colors and designs and it’s easy for little ones to apply the tape to give old wooden clothespins a brand new look. 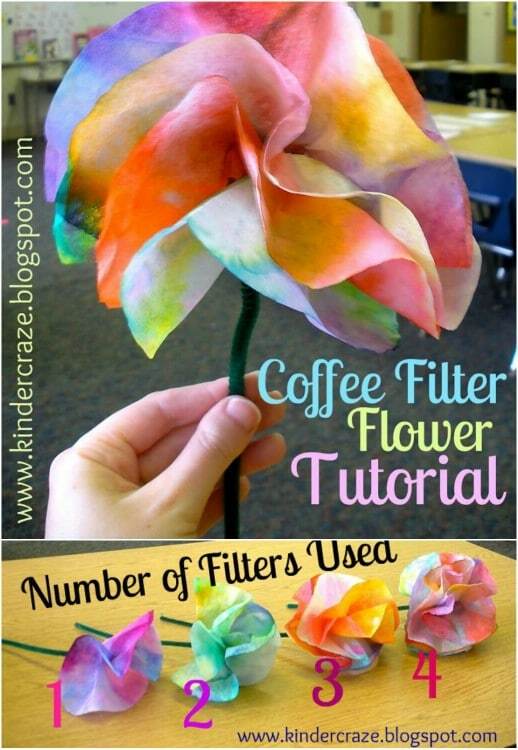 Not only are these little DIY coffee filter flowers easy for your toddler to make, they’re also really cheap. Coffee filters are very inexpensive and you get several in a pack, so you can do an entire bouquet with your little one. You will need a collection of markers, about four coffee filters per flower and a few other supplies to create your blooms. 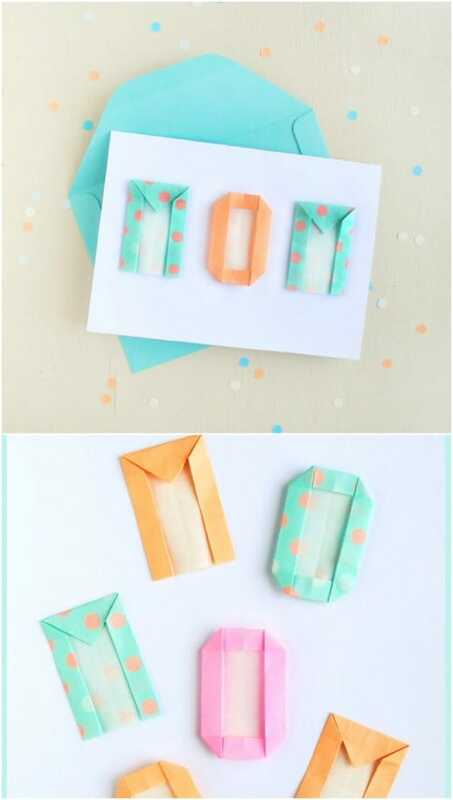 This is one of the easiest DIY Mother’s Day gifts for kids to make. 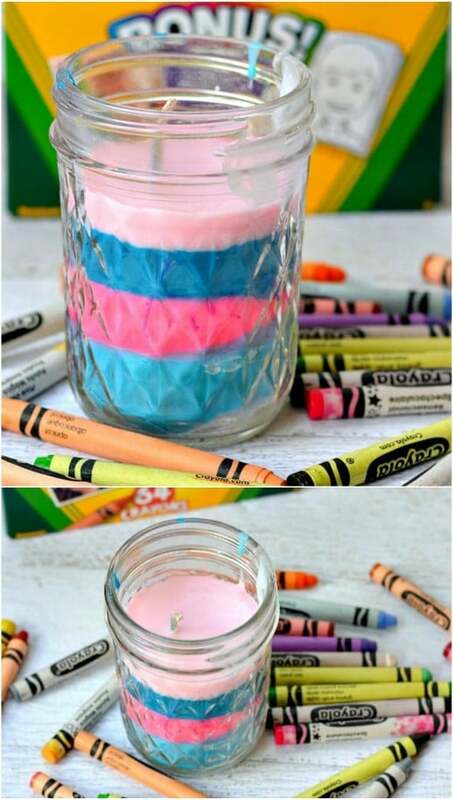 Kids love crayons almost as much as they love Mom, which makes these DIY crayon candles the perfect Mother’s Day gift for your toddler to make. While you will need to help your little one with the melting of the crayons, they can choose the color scheme and even help you to break up the crayons to get them ready for melting. These make lovely layered candles that Mom is going to love. Mom will likely want to share this delicious DIY Mother’s Day gift with her favorite little ones. 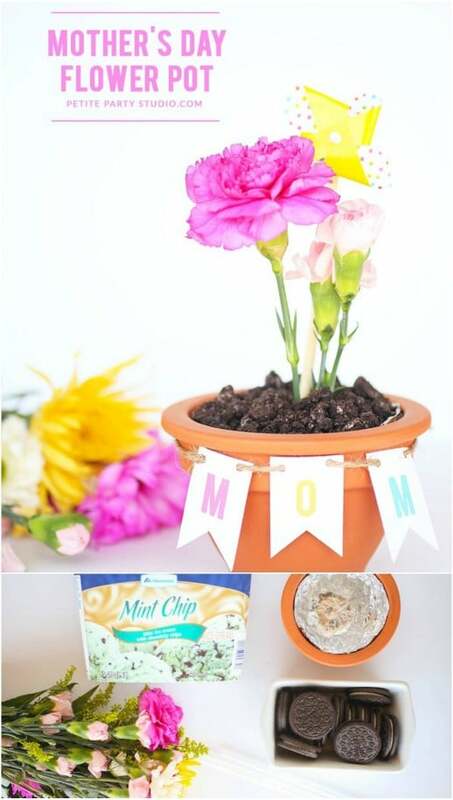 The gist of this project is to take a regular terra cotta flower pot and create a little snack for Mom from Oreo cookies and ice cream. Then, you add fresh flowers – or you could add DIY flowers that your little ones make themselves. Mom deserves a beautiful corsage on Mother’s Day and your toddler can make her one from a cardboard egg carton. 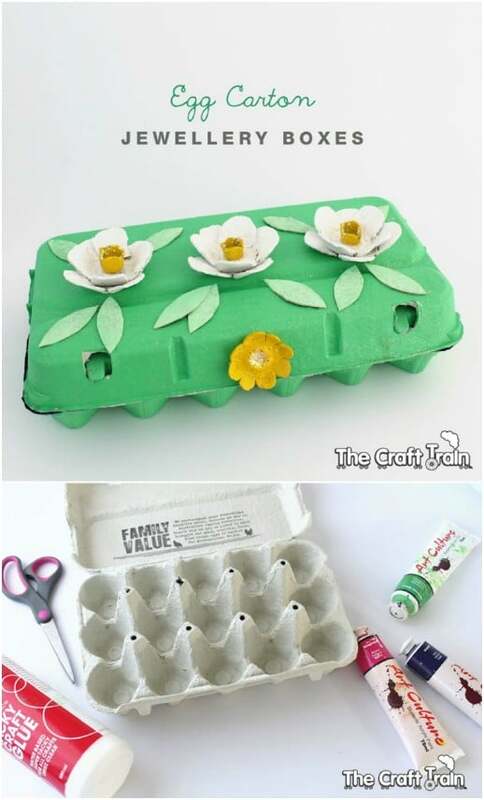 These DIY egg carton flower pins are gorgeous and your little ones get to choose the colors and designs that they have. Just help them with the cutting and let them do their own thing to decorate their flower however they want with paints, crayons or markers. Your little ones can turn an empty tin can into a gorgeous little pencil holder for Mom’s desk. This would also work as a vase. You just need a picture of your toddler or preschooler and some paint or crayons and of course, an empty can. I love projects that let you upcycle tin cans into beautiful and useful décor! 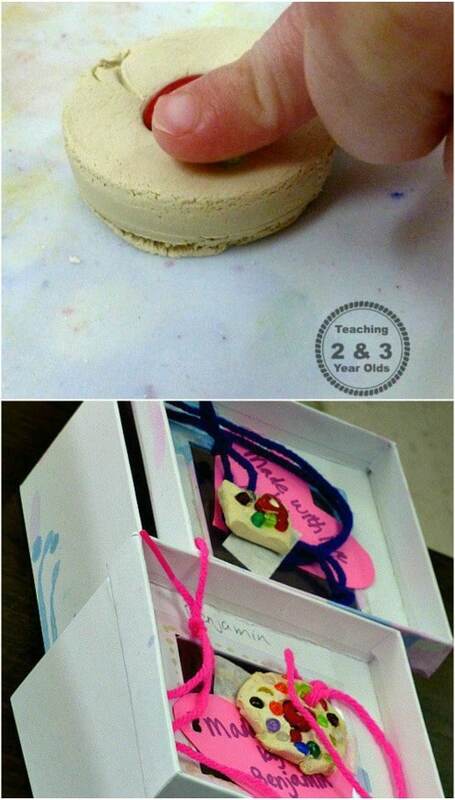 Here is another wonderful gift that your toddlers can make for Mom on her special day. This one is made from a cardboard jewelry box and they can create their own designs with paints, markers and other embellishments. Help your little ones with the cutting on this one and then let them create their own artwork on Mom’s special gift. Give Mom a gift that she will treasure forever with these little hearts that your toddlers make with their fingerprints. 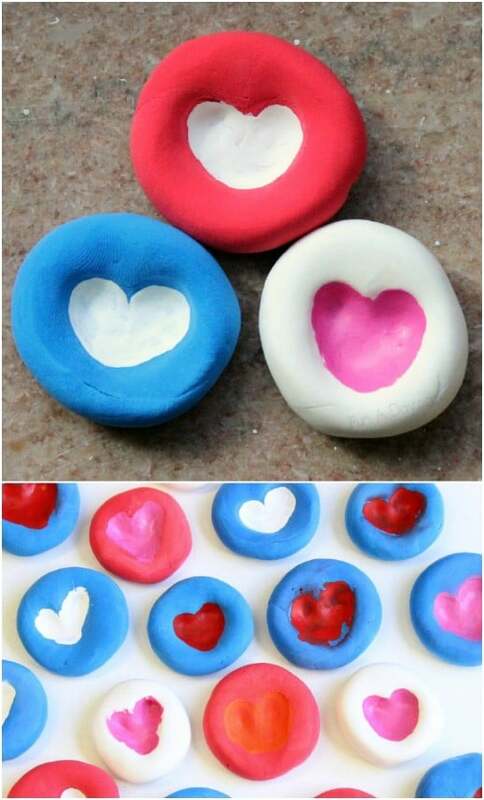 These are super easy and you could even make your own playdough to use to mold them. 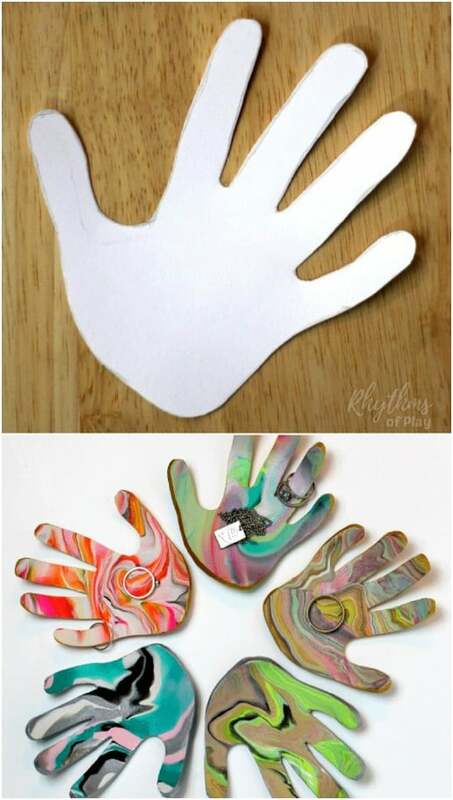 Once they have created their fingerprint hearts, your toddlers can paint these hearts however they want and you can glue on magnets so Mom can keep them on the fridge or they make wonderful mini paperweights for her office. 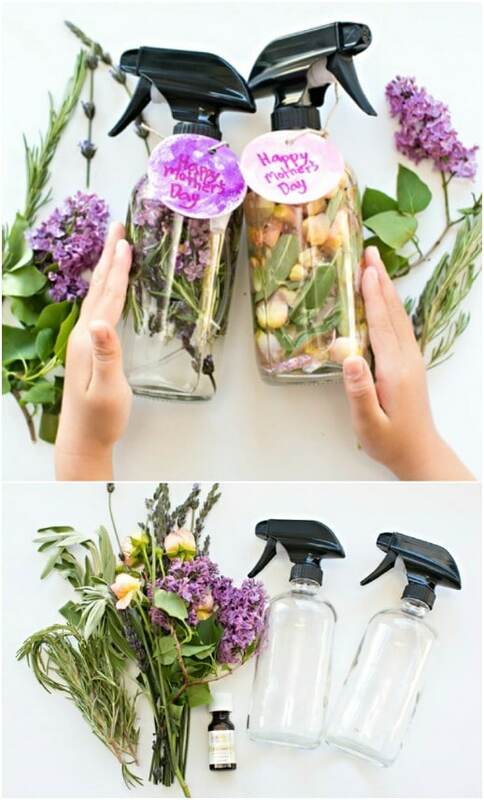 This homemade floral herb perfume is really simple for kids to make and Mom will love it. You need to gather some assorted flowers and herbs, and the kids can help you with this one. You also need a spray bottle and some essential oils in whatever scent that your little ones want to use. This DIY paper flower bowl is really easy to make and there is very little work involved for your toddler. 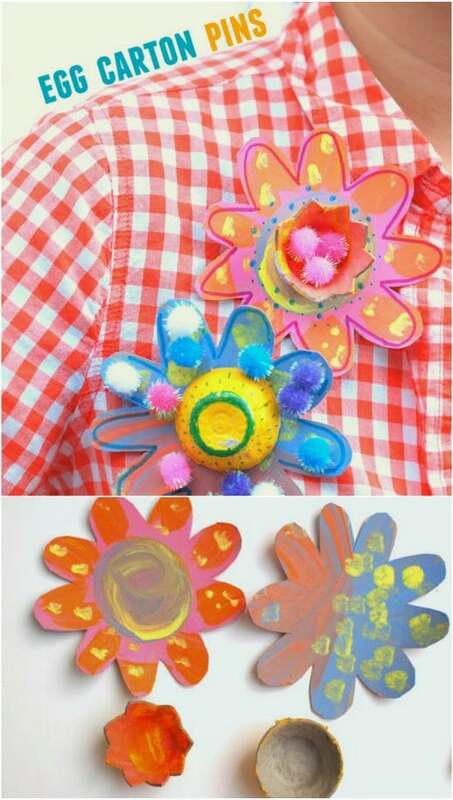 You can print off the colorful flowers and then let your little one help you to mold them into a bowl shape. Mom can use the bowl for jewelry or any number of other things. You will need the flowers, as well as a bowl for the mold, Mod Podge, plastic wrap and a few basic craft supplies to make this one. 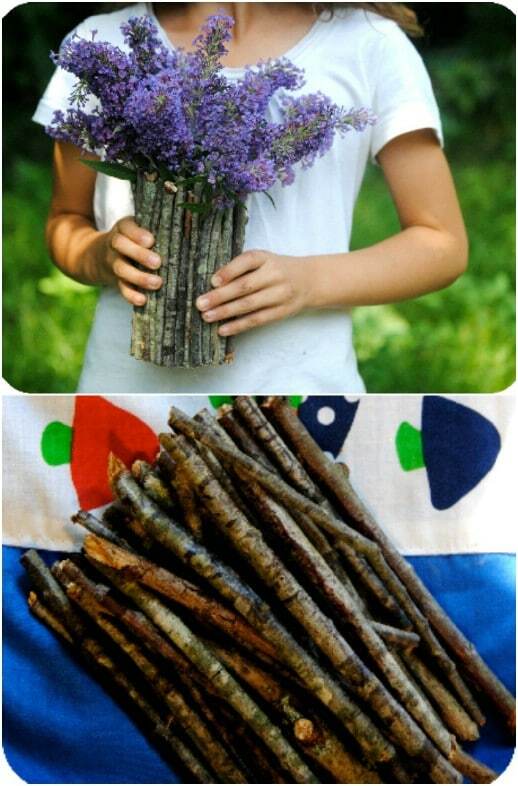 Kids can not only make this DIY branch vase, they can have a blast helping to find the branches and twigs that they will use to make it. Let them gather a handful of twigs and small branches and then help them to assemble those gatherings around a glass or vase to mold the vase and hold it in shape while you glue everything together. I love DIY garden projects using sticks and twigs! Their little footprints are precious and perfect for a DIY Mother’s Day gift. 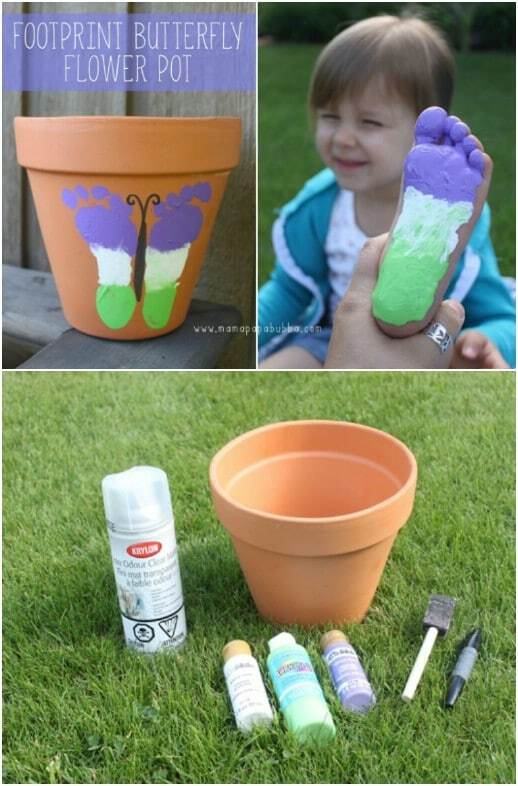 You just paint their little feet and then help them to stamp those footprints on a terra cotta pot. Then, you create a butterfly from their footprints and it makes the perfect gift for Mom on her special day. Older children could do this one completely on their own and toddlers and preschoolers will only need a tiny bit of assistance. 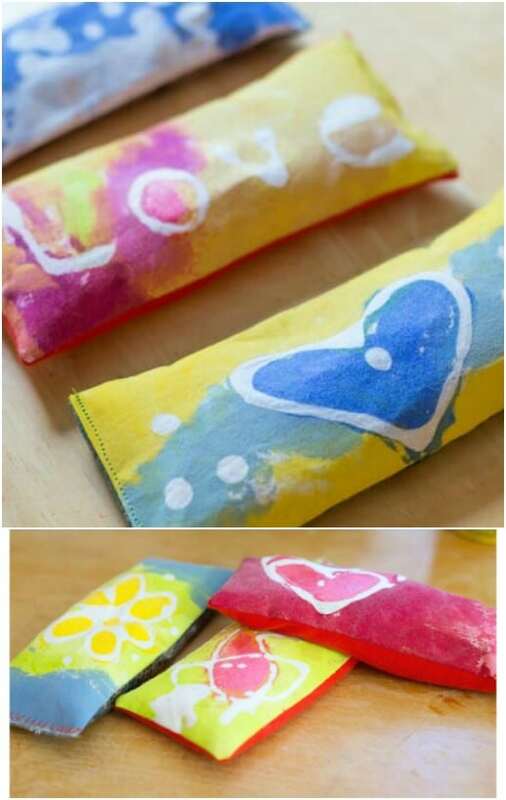 These little hand painted votive holders are the perfect gift for Mother’s Day to make with toddlers. You just need a few glass candle holders, and you can get these at the Dollar Store for around a dollar each, and some paint. 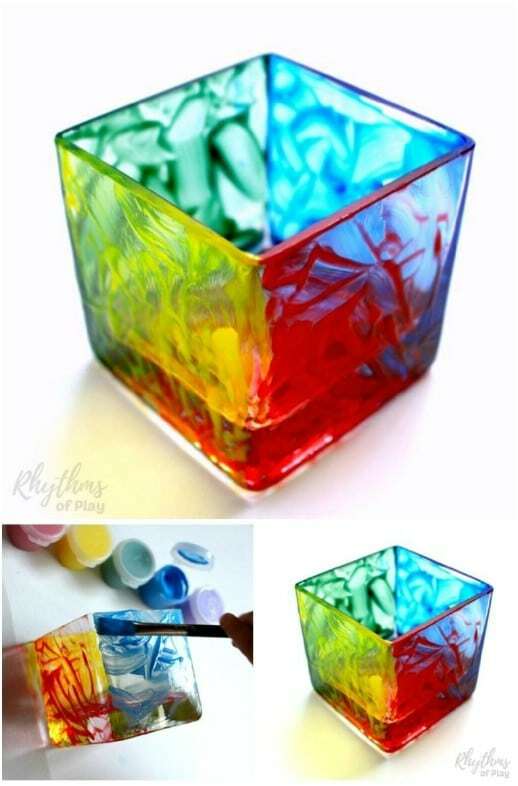 You need glass paint to make these and a few brushes, depending on how many colors your little ones want to use. A plain white apron, which you can pick up at any craft store, a few paints and the hand and footprint of your toddler are all you need to make this special gift for Mom on Mother’s Day. The hand and footprint of your little one help to create butterflies and flowers for Mom on her apron. This one is really easy to toddlers and preschoolers. 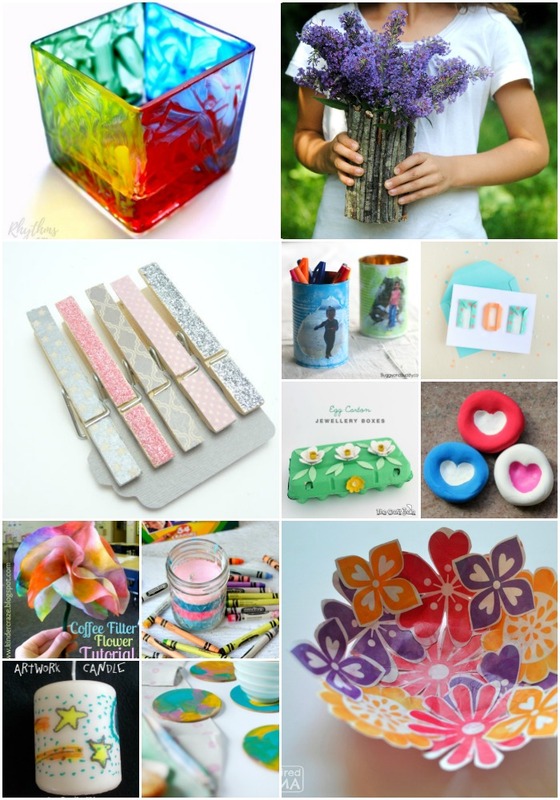 Allow your little ones to express their creativity and create a gift for Mom on Mother’s Day at the same time. 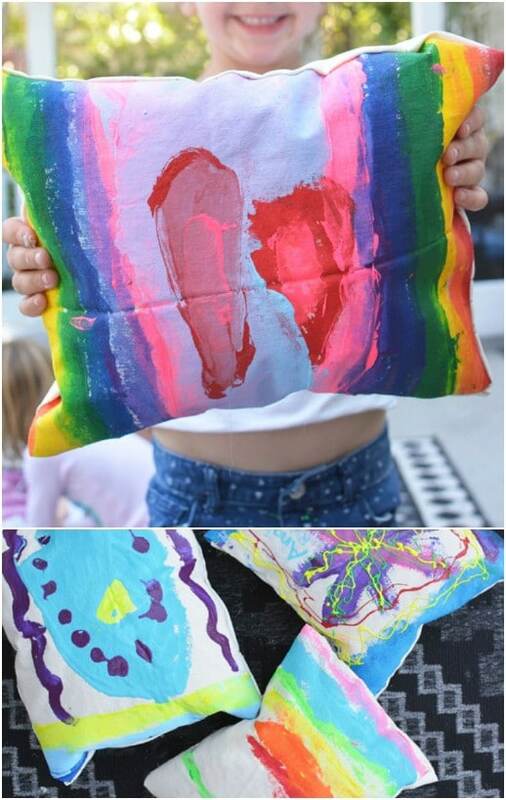 Some canvas and a few finger paints let them make the perfect pillow for Mom’s special day. You could also do these with plain white canvas pillows that are already sewn together, to make it even easier to create these DIY hand painted pillows. These DIY accent pillows are sure to make Mom feel special. These lavender eye pillows are the perfect gift for Mom on her special day. Toddlers can help by designing and coloring the fabric and filling them with the DIY lavender mixture. You just have to cut the fabric into shape and then sew it together, which is an easy enough step. These are perfect for helping Mom to get a good night’s sleep. Lavender is such a relaxing herb and who doesn’t just love a good eye pillow? These little DIY playdough handprints are such a traditional gift for Mother’s Day. I remember my little ones making them in preschool. They’re pretty easy and you can make your own playdough for them. Once they’re done and set, just let your toddlers choose how they want to decorate them and make them special. They can use paint, glitter and any number of other items to make them unique. Kids adore making these little macaroni necklaces and they can color these to make a beautiful necklace for Mom on Mother’s Day. You can do these macaroni necklaces with any pasta that has a hole in the middle, like elbow macaroni, penne pasta or rigatoni. 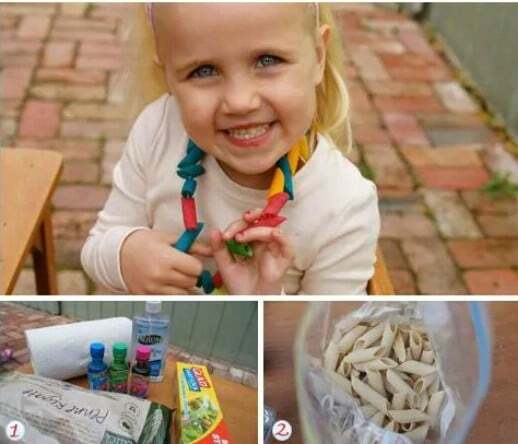 Kids color the pasta with food coloring and once it’s dry, they just add it to string for make the necklace. Your little ones can make Mom her own crown for Mother’s Day with some pipe cleaners and pom poms. Toddlers are going to love making this crown as much as Mom will love wearing it, and while we know that Mom is Queen for more than just the one day, the project will thrill your little ones to make her feel extra special. This is such an easy project for kids to do! Little handprints mean so much to mothers and this little marbled clay jewelry dish is in the shape of your little one’s hand. Mom is going to adore this one and it is really easy to make. You will need some modeling clay and a few paint colors to design it. 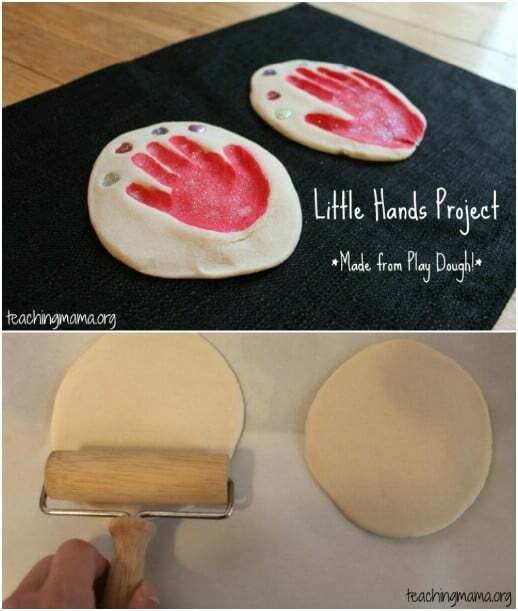 The gist of the project is really simple and your toddlers are going to adore shaping their own handprint dish for Mom. This origami card is really easy, even for toddlers to make. You will need to help them to create the letters but they can decorate them all by themselves and then turn those letters into the perfect card for Mother’s Day. Let them make this card and then give it alongside a DIY gift that they have made, too. 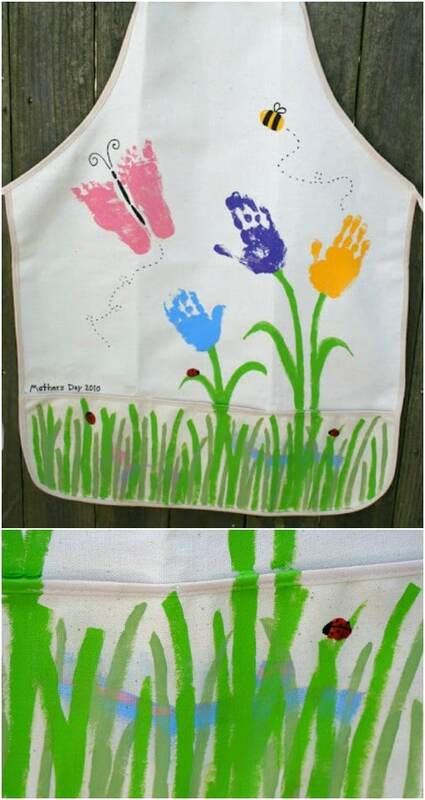 A plain white canvas book bag that you can get at any craft or hobby store and some paint give your little ones all that they need to create a special gift for Mom on Mother’s Day. 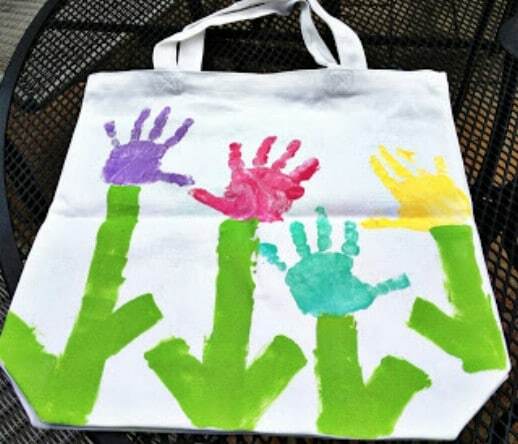 This handprint book bag is perfect for helping Mom to organize and carry her favorite books or magazines and toddlers are going to love making it with their painted handprints. Get a few rocks out of your yard and let your toddlers and preschoolers turn them into gorgeous little paperweights. 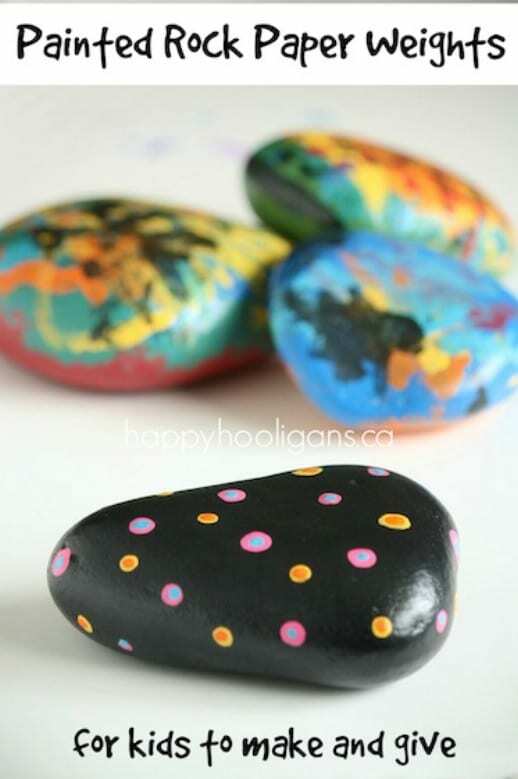 These rock paperweights are super easy to make and they let your little ones express their own creativity by designing what they want to put on them. Just give them some paint and let them get to work creating a lovely gift for Mom on Mother’s Day. 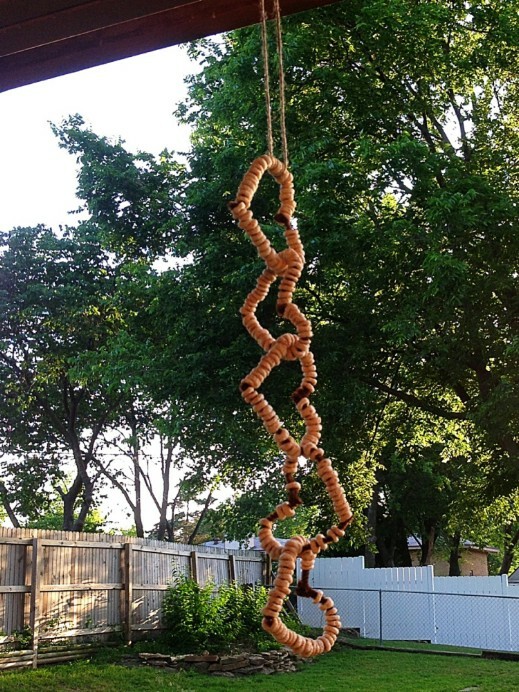 DIY bird feeders are always a good idea for Mom, and this one couldn’t be easier to make. Just get your little ones some Cheerios and pipe cleaners and let them string up their own bird feeder for mom. You could also cover the Cheerios in peanut butter and birdseed but they work just as well on their own. And, this is a really simple project for toddlers to do on their own. 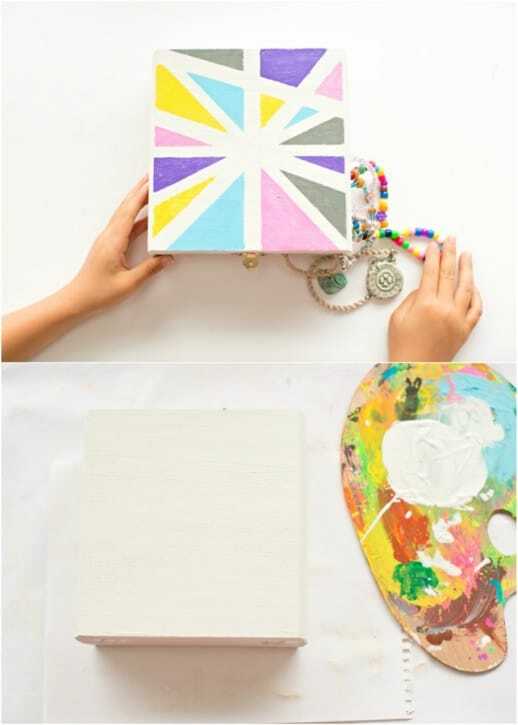 An empty wooden box, which you can pick up at any craft or hobby store, some masking tape and a few paints give your toddler all they need to create this gorgeous DIY wooden treasure box. They just mark off where they want their paints to be with the masking tape and then paint the uncovered sections. Mom could use this as a jewelry box, a recipe box or a keepsake box for special gifts. 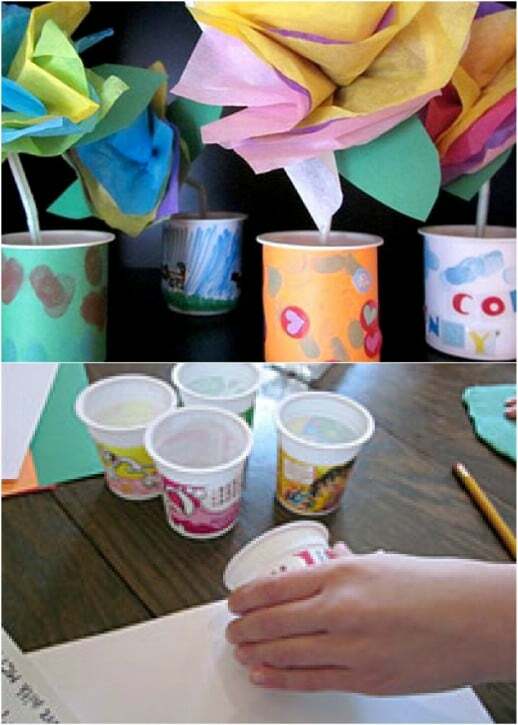 Turn empty yogurt cups into gorgeous little vases for Mom and fill them with kid made tissue paper flowers. This is a wonderful little gift that your toddlers can do, mostly on their own. You just need empty yogurt cups and some craft paper and stamps or stickers. They can create their own designs and these are so easy that they could do a couple of them and fill them with their homemade flowers.